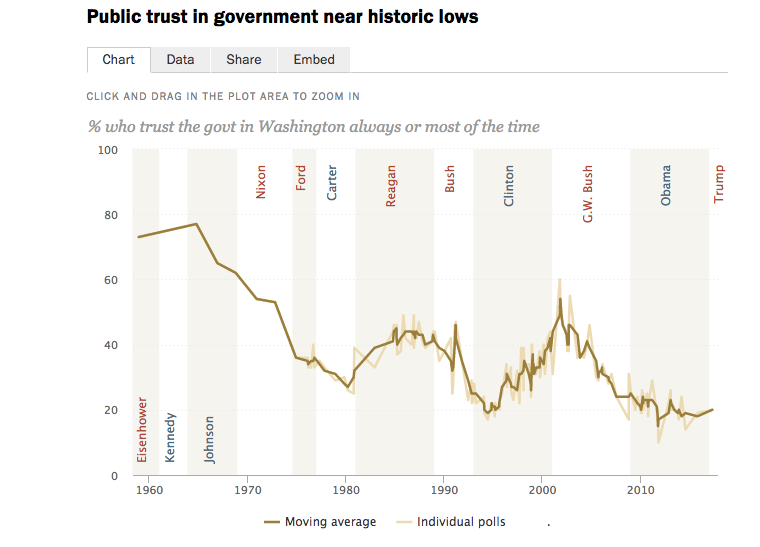 It will be no surprise to anyone reading this that public trust in government is near historic lows. We don’t trust the government, and we don’t trust the media. Based on a May 2017 survey, just 11% of Republicans have a lot of trust in national news organizations. While gaps in trust have a distinct partisan divide, there is also a distinct racial divide. Data collected in August of this year show dramatic differences between how whites view police versus Black and Hispanics. 73% of whites view police warmly compared to 30% of blacks. When we ask questions about the role of discrimination and white privilege in daily life the numbers are just as stark. When asked if white people benefit from advantages in society that black people do not have, 54% of whites say “not too much” or “not at all.” Compared to 7% of blacks. There is a dramatic divide across race in our country. And this divide leads to tremendous distrust. Data indicate that white folks underestimate the extent of this distrust. So, the bad news is that levels of distrust are at historic lows, across all indicators. And, distrust appears to have significant partisan and racial components. We are divided by politics and demographics. These divisions exist at the national level, and locally.  Here in Charlotte-Mecklenburg, we are a community characterized by stark racial and socioeconomic isolation. These divides and these divisions did not happen by chance or by choice, but by policy. Most often, federal policy. Unsure of these divisions that cut across our counties’ geography? Take a few moments to use the Quality of Life Explorer. Using this tool, you can see a clearly visible pattern for almost every variable, often referred to as the wedge of wealth in the southern and northern part of the county and the crescent of poverty around the city. This same pattern plays over and over, regardless of the topic. Median income, percent Black, prenatal care, water consumption, receipt of social services, 3rd grade reading scores—same geographical pattern. While the data indicate that race is a critical piece of the puzzle, so is poverty. Our poverty rate in Mecklenburg County has shifted quite a bit over the years, settling now at 15%. While disparities across race and poverty are stark, when you add age, the numbers are more disturbing. 36% of black children, and 39% of Latino children, live in poverty in Mecklenburg County, compared to 5% of white children. And to complicate matters, the demographics of our community are shifting. Dramatically. We have been a plurality community for a few years now, meaning that there is no one majority racial or ethnic group—white people are not a majority in our community and haven’t been since 2014. Possibly related to this demographic shift is a glimmer of hope in the data. The number of folks that see racism as a big problem is increasing again. Racial disparities are being named. Many folks have moved on from the color-blind mythology, white privilege is a household term for many, and those in power can no longer say that they didn’t know. See, we have all this data, all this evidence, this compelling literature that demonstrates that racial disparities and discriminatory treatment are not a figment of imagination, the disparities aren’t the result of inferiority or inadequacy, but by deeply entrenched systems designed to simultaneously oppress and elevate. Purposefully. Most often as a result of federal policy. And for many folks, with new information comes awareness. Redlining, urban renewal, the discriminatory impact of Social Security and the GI bill. Ten years ago, very few people were talking about this. Now, redlining has entered the lexicon of many, not just those obsessed with housing policy. This history is no longer deleted from the history books. It’s coming to light. And there are hundreds of books, articles, commentaries, and sites, like Mapping Inequality that bear witness. See the blue marker on this map? That’s my house. Where I’ve lived for over 10 years. This type of information wasn’t available to the public even a few years ago, but now I can now see the effect of redlining on my own neighborhood. Look at the map, look at the data within the Quality of Life Explorer, and you can clearly see how this practice has shaped development, home values, and generational wealth in our community—especially now. My house also had a racial covenant in place prior to being outlawed with the federal Fair Housing Act (1968). Seeing as two of my immediate neighbors are in their 70s and grew up on our street, these racial covenants directly affect the racial composition of my neighborhood right now. Many people, like myself, are reckoning with the systems of advantage we have lived within, realizing that we were born on third base. 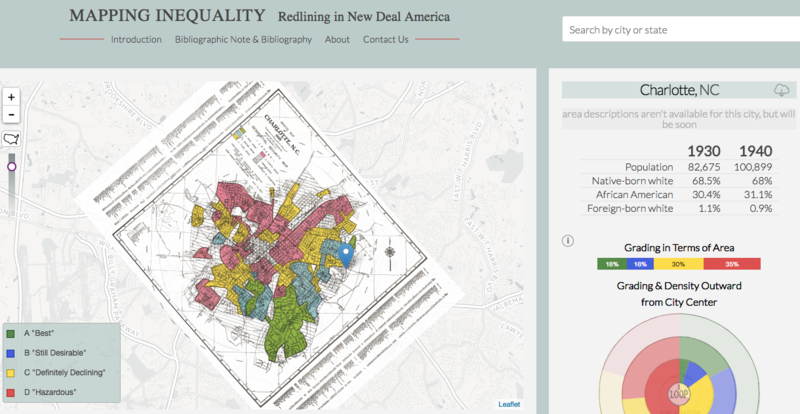 If you look at redlining maps of Charlotte, my parents both grew up in houses that were in areas a person of color could not live, and attended Myers Park High School, which was completely racially segregated white, and funded at 5 times the amount of racially segregated black schools at the time. 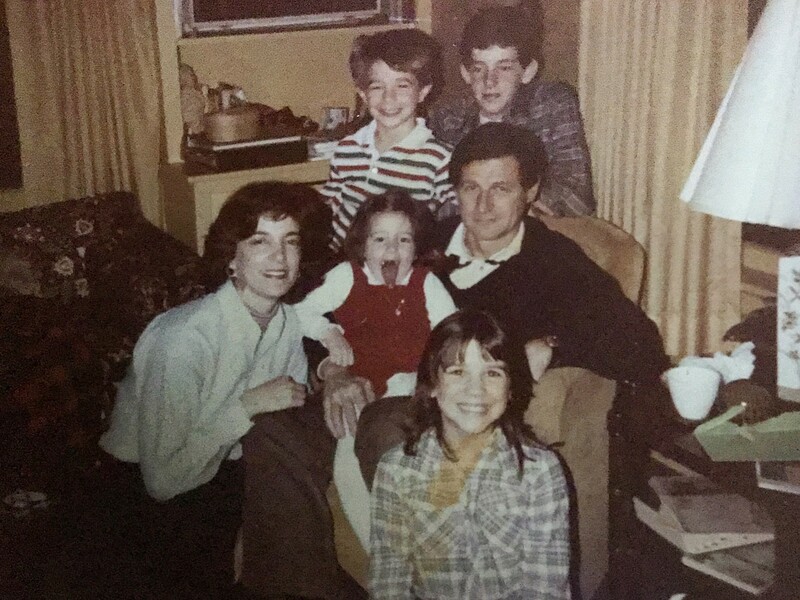 Our family didn’t create generational wealth from the parsonage my mother lived in off Providence Road, but we certainly created generational wealth from my father’s childhood home in Myers Park that was sold in the 1980s. This is our last family picture taken in my grandmother’s house off Providence Road. (Yes, I’m the one in red with the tongue sticking out). On the original redlining map, my grandmother’s house was right on the edge of the green, in the blue area labeled as “still desirable.” This property, which was only available to white families when my grandparents bought it, came with tremendous benefits. Not only did this house purchase free excellent schooling for my father, uncle, and aunt (at the time, Myers Park High School was a brand-new facility), but because of its location, the property appreciated dramatically. The access to high quality free education greatly contributed to my father, uncle, and aunt’s success. The money made from selling this home was transferred to my grandmother and her three children, and to me, my cousins and siblings through cash gifts, presents, and financial support that we received from my grandmother until her death at the age of 98. This support is one of many related factors that has led almost all of her grandchildren to be college graduates and homeowners. Generations of Hawns have benefited from the same federal policies that prevented generations of people of color from accessing high quality public schooling and creating generational wealth. I have benefited from discriminatory policies—as all white people have. We have an affordable housing crisis in Charlotte that disproportionately impacts families of color. When we reckon with the history of housing policy in America, this disproportionate impact isn’t a surprise. The roots of this crisis are from policies based on race. Yet, to counteract the policy impact decades later, we are relying on programs and services that disregard race. Can the decades long impact of discriminatory policies be counteracted by nonprofits and improved service provision? The current state of our housing crisis would say no, our approach is insufficient. Instead, we must focus on policy. I would argue that to address the housing issues in our community we must reckon with the racialized history of housing policy, then support policy that benefits all of our community rather than affirmative action for those that look like me. So, what are some of those policies we should support? Well, that will be another blog post soon. Want to read more about the historical legacy of discriminatory housing policies? When Affirmative Action Was White, Ira Katznelson, 2005. The Color of Law, Rochard Rothstein, 2017.  The Quality of Life Explorer is a long-term collaboration between UNC Charlotte, Mecklenburg County, and the City of Charlotte.